This is the Café Quartier 206 in the basement of a building called Quartier 206 on Friedrichstrasse in Berlin, Germany. Quartier 206 is a part of a complex of three buildings, and houses luxury retail shops. It was designed by architect Henry N. Cobb, and opened in 1996. 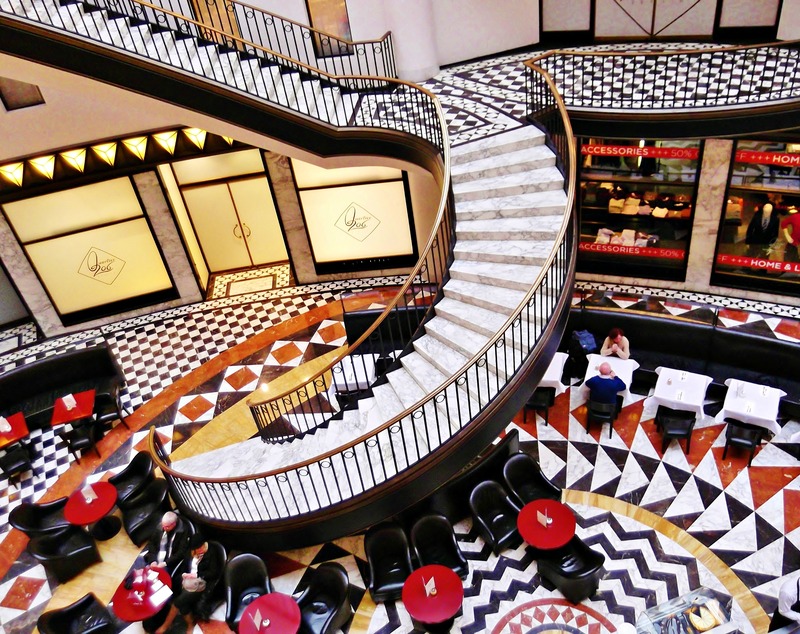 As Berlin is in love with Art Deco, this department store is an hommage to the 1920s’ art style. I’ll soon write an article on Friedrichstrasse, so stay tuned. If you want to check out the first post on my trip to Berlin, go here. Wow, that’s really bright and busy! Now I’m quite frustrated I didn’t visit that amazing place when I was in Berlin last summer. Guess I have to go back soon! Good idea, I will return to Berlin this summer as well! So gorgeous! I knew you would have a great entry for this week’s challenge :-). Wow! Absolutely stunning photograph. And so perfect for the challenge.